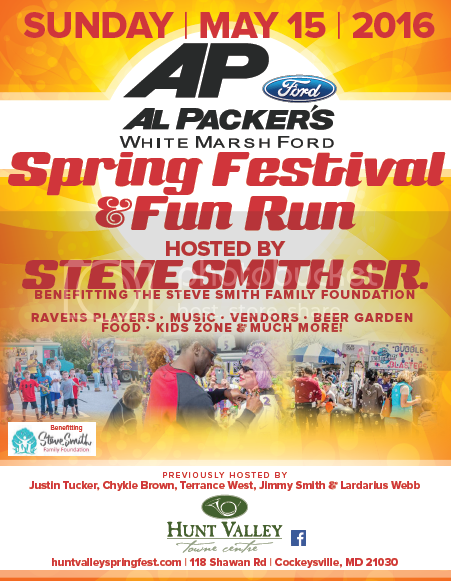 Hunt Valley Spring Fest and Fun Run hosted by Baltimore Raven Steve Smith! We have went to this in the past and it's tons of fun for the whole family! Especially if you're Ravens fans! This year's event is Sunday, May 15th and promises to have something for everybody. New this year is the Hunt Valley Fun Run benefiting Special Olympics of Maryland and the Steve Smith Foundation! To participate it's only a $20 donation to walk, run, hop, or skip to support this awesome cause! Then enjoy the Party Pavilion and the festival at the conclusion of the race! During the festival, be sure to check out the Q&A with some of your favorite Ravens Players...find out what they've been doing during the off season and how they are preparing for the 2016 season!